Knotts Berry Farm is getting in on the latest theme park craze: putting visitors in a virtual world created primarily by software engineers instead of carpenters and welders. 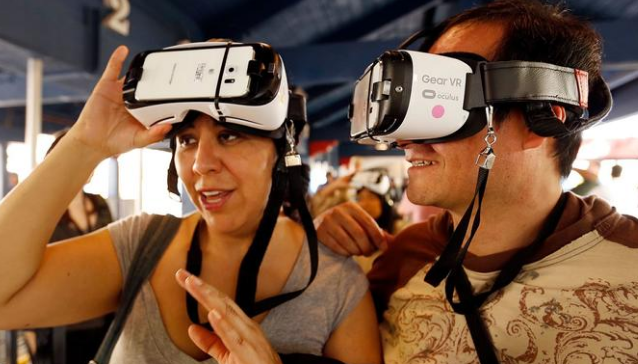 Six FlagsMagic Mountain in Valencia began last year to strap virtual reality headsets to riders of its Revolution roller coaster to give them the sensation of flying through space as they shoot at alien aircraft. Similar virtual reality elements were added to roller coasters at nine Six Flags parks across the country. Its a very cheap way to add a new attraction or extend an older attraction, said Martin Lewison, a theme park expert and business management professor at Farmingdale State College in New York. At Knotts Berry Farm, the new attraction lets visitors score points by destroying the bad robots and completing objectives, said Ivan Blaustein, director of product integration at VR Studios, the company that created the headsets and software for the theme park. Knotts Berry will be charging an introductory price of $6 to try the new attraction, on top of the regular park admission price. Dont expect to see virtual reality headsets used at major theme parks like Disneyland or Universal Studios Hollywood, Lewison said. Theme park purists dont like it, Lewison said. Theyd much rather go on a $250-million ride at Disneyland than throw a mask strapped to a Samsung smartphone over my eyes.